on central banks, collateral intermediation, shadow banking, global finance. Today, I attended a CMU event organised by Bruegel and HM Treasury at Westminster. The keynote address from the City Minister Harriet Baldwin was followed by a panel with market participants (the buy side – asset managers and insurers – and a credit rating agency), a Commission official and a Treasury official. The view from the government: UK a staunch supporter, celebrating the CMU as an excellent initiative of the type that Brussels and the EU should be generating more often. Having a UK Commissioner in charge of CMU clearly helps. Beyond the consensus 'CMU is a good idea' and between the lines, I noticed three issues. This is one of the sensitive points in CMU, and a lot of energy spent in documents and meetings to pretends that's not the case. Although the Commission and several member states (see the 5 presidents report) would prefer to create a supranational regulator for integrated capital markets, UK opposes it strongly. According to this view, ESMA - the candidate for a pan-European regulator - is best placed to ensure that national regulators implement supervision effectively. In the context of the Brexit referendum, ‘the last thing we need is institutional change’ captures well the British politics of the CMU. Is there a danger that European states repeat the pre-crisis mistakes with cross-border banking? The banking crisis demonstrated that the prevailing regulatory nationalism was ill suited to deal with the coordination issues between home and host regulators. Ask any Eastern European banking supervisor. The pessimistic British response to this question points to the foot dragging on the institutional architecture of the Banking Union. The hesitations and compromises there are steadily eroding (market) confidence in the ability of European politicians to create strong pan-European regulatory bodies. The optimistic view is that supervisory convergence that harmonizes rules would be enough to put the CMU on strong foundations. One of the panelists questioned the premise of the optimistic view that for a single market it is enough to have common rules (and I would add, a rather fuzzy notion of ‘convergence’). In accounting, the application of rules (international standards) is not uniform – the fragmented enforcement of rules effectively entrenches the type of cross-border barriers that CMU aims to remove. The Commission recognises the validity of this point but is prepared to put the question aside because it wishes to avoid politically divisive topics. So instead of calibrating the regulatory architecture to integrated markets, CMU envisages as next step a comprehensive review of post-crisis regulation. Given the complaints from the industry on the post Lehman ‘regulatory tsunami’ (loud and clear at this event too), expect this ‘proportionate regulation’ agenda to accelerate the process of watering down regulation that is already unfolding. Recall this argument when your UK pension fund with exposure to German SME securitisation takes a massive hit due to large defaults in a market illiquid during crisis. And pray that ECB has normalised ABS purchases. Market participants typically focus their CMU interventions either on deploring ‘regulatory tsunamis’ or identifying CMU areas that would improve synergies of their business model. In an unusual departure from the script, one panelist sought to make constructive criticisms. And it picked the elephant in the CMU room: government bond markets. It is surely a measure of the creative genius of European regulatory politics that a project on furthering the integration of debt markets manages to say nothing about the largest debt markets in Europe (in Eurozone, EUR 6.8 trillion out of EUR 14 trillion outstanding in August 2015). Before Lehman and the sovereign debt crisis, the European agendas for financial integration used to stress the critical role that government bond markets play in financial markets, as proxy for risk-free interest rates, benchmark and hedging instrument for positions in other fixed income markets, and reserve ‘safe’ asset. The ECB made the integration of sovereign bond markets a priority, and used its lending collateral framework to accelerate it (by treating all Euro sovereigns as identical in terms of credit risk). The 2002 Collateral Directive was designed with the same ambition in mind – to allow private financial institutions to raise funding cross-border regardless of what sovereign collateral they use. So can we have integrated capital markets with fragmented government bond markets? 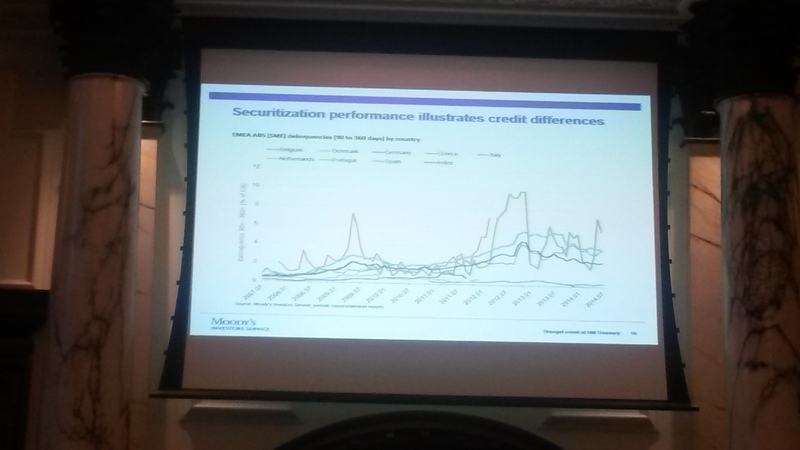 One of the panelists argued that securitisation performance across countries reflects credit differences between sovereigns (the graph below, in a rather bad photo, mea culpa). So much for reviving the European securitisation market. Yet the CMU authorities have tended to fudge this question because answers are as politically divisive as the issue of supranational regulator. If CMU was to make government bond markets a priority, what would concrete policy measures look like? Put differently, if CMU is about persuading German savers to give money to Portugese corporations without a bank in between*, what would it take to persuade that German saver to give money to the Portugese government? Or even more complicated, how much would a Portuguese SME need to pay a German saver to borrow when that saver is reluctant to lend to the Portuguese government? Here the CMU official supporters answer the usual European way – not a priority to think about it. Private finance agreed that the FTT plans are at odds with CMU. Putting the FTT genie back in the bottle has been a priority, particularly for the European banking lobby**. Yet the FTT genie has proven more resilient than many expected. Recent statements suggest a new impetus to finish negotiations, as France independently decided to extend its own FTT to intraday trades. This raises interesting questions of coordination between DG FISMA, that is designing CMU, and DG Taxud, that designed and (still) defends the FTT in the working groups of the 11 member states. The best that the former can do is to follow negotiations closely and ensure that member states are aware that the tax should minimize impact on market liquidity and NEVER EVER include the repo market. The priority remains funding for SMEs. Repo, shadow banking, government bonds, and supranational regulation, are not a priority of CMU. The art of political compromise in Europe rests precisely on that ability to postpone critical questions. If we try very hard to ignore these questions they may go away. * best translation I've heard of the CMU ambitions. ** the EBF response to the CMU Action Plan stresses that ' If European lawmakers are indeed serious about CMU, they also need to recognise the importance of liquidity in financial markets. Proposals such as the Financial Transaction Tax (FTT) and Bank Structural Reform (BSR) are at odds with the objectives of CMU. Dropping these proposals will greatly enhance the chances of success for CMU'. Does this sound outlandish? Consider the current state of the distributional game in the United States, a country that, unlike Ukraine or China, is still considered a democracy by many. According to Emmanuel Saez, in 2010, the Year Two after the crisis, at a time of high unemployment and record public debt, 93% of all income gains in the US, i.e., almost the entire amount by which the national income increased , went to the top one per cent of the income distribution. What is more, the top 0.01%, about 15,000 households, received more than a third, 37%, of those income gains (Saez, 2012).31 There is no reason not to call this an asset stripping operation of epic dimensions perpetrated by a tiny minority benefitting, among other things, from the deepest tax cuts in history. Why should the new oligarchs be interested in their countries’ future productive capacities and present democratic stability if, apparently, they can be rich without it, processing back and forth the synthetic money produced for them at no cost by a central bank for which the sky is the limit, at each stage diverting from it hefty fees and unprecedented salaries, bonuses and profits as long as it is forthcoming – and then leave their country to its remaining devices and withdraw to some privately owned island? To include such [repo] transactions will simply pose a major risk to the functioning of the credit market. Yet it turns out that the European repo market is European but in name. Consider the membership of the European Repo Council (ERC), the private lobby that champions the interests of the repo market players in Europe. Of its 75 members in September 2014, 19 sit on the European Repo Committee, the governing board of the ERC. Eleven of these – five headquartered in the EU - are on the FSB’s 2013 list of Globally Systemically Important Banks (G-SIBs). The ‘European’ repo market captures the systemic footprint of global banks headquartered in Europe and elsewhere. Its growth has been driven by what Haldane called the ‘collective migration’ of bank business models to interconnected, leveraged, high-yield trading activities. Carney's ambitions for shadow banking reform: empty promises?